Rabbi Mordecai Kaplan, the founder of Reconstructionist Judaism, taught more than sixty years ago that Jews in America live in two civilizations, meaning that they are influenced by two different sets of values, norms, and cultures. In today’s world all people have multi-faceted identities. Interfaith couples and families know that their different religious and cultural backgrounds can sometimes lead to situations in which conflicting values seem to apply. For gay and lesbian interfaith couples, there are certain value conflicts that frequently become apparent in the course of the relationship. 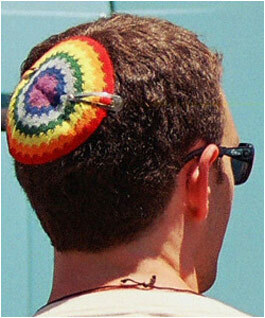 Jews and gay men and lesbians share the status of being members of minority groups with long histories of oppression. Each of these groups has historically drawn different lessons and values out of the experience of being persecuted. For Jews, anti-Semitism has made the threat of “dying out” feel very tangible. Even as anti-Semitism seemed to have abated in the world, Jews still worried about the survival of their faith. As Jews have had more opportunities to assimilate into the larger secular culture and interact with others, the real possibility has emerged that they will give up their Jewish identity. In the United States, there has been a longstanding concern by the organized Jewish community that Judaism will be lost in the greater culture. Consequently, many Jews have reacted to their concerns about Jewish continuity and survival by opposing intermarriage and becoming increasingly insular. Gay men and lesbians have responded to oppression very differently. Homophobia denies gay men and lesbians the right to live freely and with full rights as member of society. Oppression’s impact has been to strengthen the resolve of gay men and lesbians to be accepted by the majority culture, and to embrace differences between people. For gay men and lesbians, acceptance for being who you are is a value of utmost importance. All interfaith couples know that the experiences each partner has had with organized religion, positive and negative, will play a role in the decision-making process the couple engages in about what role religion will have in their life together. Many gay men and lesbians have been subject to homophobic comments and actions in the name of religion, and these difficult experiences may lead to reluctance to explore religious life and activities together. It is important for partners to listen to each other’s stories and seek out those religious institutions and leaders who will welcome them rather than re-traumatize them. Interfaith couples looking to get involved in the organized Jewish community may find that just because an organization or group is gay-friendly does not necessarily mean that it welcomes interfaith families, and vice versa. While these couples may wish to be pioneers and educators, such as asking to be included in an interfaith couples discussion group at a synagogue, it is also important for Jewish professionals and agencies to think about whether their existing programs welcome these dual-minority couples. When gay men and lesbians form interfaith relationships, the negative attitudes that exist in Jewish communities towards interfaith partnerships can be especially hurtful to the non-Jewish partner and can feel like a violation of the queer value of inclusiveness and acceptance of difference. It is common to hear non-Jewish partners in these relationships express disbelief and frustration that their Jewish partner’s family can accept them as being gay but not as being a member of a different faith. It is important that Jewish partners in interfaith couples help their partner understand why some Jews are so concerned about Jewish survival. Another area of potential conflict for some gay and lesbian interfaith couples is over marriage and sexuality. Those Jewish communities that have welcomed gay men and lesbians have often assumed and expected that homosexual partnerships would embrace the same models of heterosexual relationships that Judaism embraces–lifelong, monogamous partnerships which would result in children. Some gay and lesbian interfaith couples may find this assumption overly presumptuous and in potential conflict with their other values; for example, monogamy is more openly questioned and debated in queer culture. Some gay men and lesbians object to the well-intended efforts of gay-friendly Jewish leaders and organizations to offer same-gender Jewish weddings. The issue of weddings remains a controversial one in gay and lesbian culture due to concern about adopting heterosexual rituals from which homosexuals have historically been excluded. While gay men and lesbians are increasingly choosing to become parents, many do not have children, and may feel excluded in family-oriented religious institutions. Gay and lesbian interfaith couples should communicate openly about the different models of relationships and family that they draw from and try to live in a way that best embodies the values that they hold most dear. Partners in gay and lesbian interfaith relationships should expect that values conflicts will arise and try to honor and understand all of the values, beliefs, and cultural norms which they bring together. It can be a great blessing to be able to be challenged by differences, and with the right communication and flexibility, most couples can bridge their differences and create a beautiful life together enriched by their diversity. Rabbi Amber Powers was ordained by the Reconstructionist Rabbinical College in 2002. She is a congregational rabbi and adult education teacher in Philadelphia, Penn., where she lives with her partner.